Where are the onions? This is the question that many onion traders around the world have been asking. As a result of the dry, hot summer in Europe, the harvest in the north of the continent is much smaller. In the US, the rain in the late summer had a similar effect on the harvest figures. Onion prices are on the rise worldwide and new trade relations are emerging. For example, China is exporting to Europe and this is a new trade flow. Other countries, such as Kyrgyzstan, are trying to get a slice of this demanding market. Dutch onion exporters are having a remarkable year. Due to the limited harvest as a result of the dry weather, the available stocks are considerably smaller. In the third week of 2019, the total volume shipped exceeded 600,000 tons, so more than 20,000 tons had been exported per week at high prices. Due to the high price of Dutch onions and the lower yield in Europe (1.2 million tons lower), Chinese onions are currently on the market. 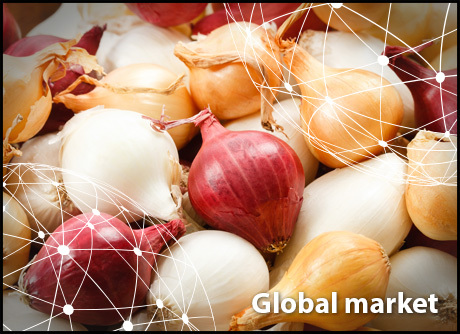 New Zealand, Chilean, Argentinian, South African and Egyptian onions will also soon reach the European market to compensate for the shortages. Currently, the demand from overseas destinations is shifting to Europe. The price is right and there are enough onions in storage for a month, but that is thanks to imports, which compensate for the shortage of Italian onions. A grower tells us that he sows 40 hectares every year. He had a good harvest last year. "The price was right from the start of the season and then increased due to the shortages in some Northern European countries," he says. Production in Italy was similar to that of previous years, which has given growers an advantage. "Prices started at 0.25 Euro/kg for the yellow and 0.30 Euro/kg for the red. This applies, of course, to the onions with the best size and quality." In recent weeks, onions have been imported from France and Austria to supplement the Italian harvest. According to a trader, the onions in Big Bags can yield up to 0.60 Euro/kg. "I still have some domestic production available. The larger sizes are sold for 0.50 Euro/kg. "He does not expect any major changes for the coming season. "I have spoken to a few seed traders and so far they have not registered a significant increase in sales, but there is still time." Another trader says that there are Italian growers who store the harvest and speculate to obtain higher prices. "It's true that we have to make up for last year's losses, but it doesn't make any sense to hold on to the stock now that the import season is starting." On the wholesale market, yellow onions are sold for up to 0.70 Euro/kg and shallots reach up to 1.75 Euro/kg. "We had not seen such prices in the past 10 years. In 2018, we got 0.30 Euro/kg for the shallots, way below the production costs." In central Germany, the local harvest is running out. A trader says that he'll probably still have German onions (yellow and red) available until mid-March. Then he will switch over to Dutch imports for a month. "Normally, we see drops of around 30% here in Hesse." From mid-April, onions are imported from New Zealand. These remain on the market until the start of the German season. Until the beginning of this month, the condition of the onions in storage remained good. "Now we see the effects of the dry, hot summer, because the product is getting old faster than normal." Yet there are no worries about shortages. The price of 48 Euro per 100 kilos is far above average. The market is under pressure this year. Nevertheless, a trader points out that despite the small sizes due to the dry weather, the quality of French onions is good. The problem lies mainly in the available volumes. This year, the supply is lower than the demand, but the prices are "correct" and regularly show a rising trend. Unlike last year, when the price stood at 150 Euro per ton, now it stands at 350 Euro per ton. It is a good year for the French. In addition to the domestic market, traders regularly get demand from other countries, but it is difficult to meet that demand. According to the French, the international demand is greater due to the shortages suffered by Dutch exporters. There appears to be a high demand for sizes 60/80 and 40/60. The harvest in Spain has recovered after the past two years and has even reached higher figures than in those years. Thanks to the abundance of large sizes and the good quality of the onions, combined with the shortages elsewhere on the continent, the demand for Spanish onions is quite high. This is resulting in good prices of up to 0.40 Euro per kilo for the onions from storage. "This is one of the best seasons I have known," says a grower and trader. "The weather has been mild this year, with no heat waves like last year." The demand for Spanish onions is so great that traders have already started importing from New Zealand, South America and South Africa to be able to meet the demand. Exporters are somewhat concerned about the closing of the Senegalese border for Dutch onions, as Senegal is an important market for them. In these circumstances, Spanish traders fear a surplus of Dutch onions in Europe in the next season. Given this year's results, the acreage is expected to be expanded. That of the first early onions is already around 10% greater than last year. The harvest of these fields starts in April/May. For the middle and late onions, it is still too early to say anything definitive. The onion supply is currently stable, but the market seems to be on the threshold of change. In the Northwest, the availability of red and yellow onions is good, but shortages of white onions have been reported. Furthermore, the quality of the white onions was not optimal, so growers sold them early in the season. Last year, the situation was the opposite and many growers waited too long to sell, causing the market to collapse. In general, the supply of white onions seems to be lower this year. Reports about a smaller harvest of white onions also arrive from Mexico and Texas. In other onion growing areas, namely Michigan, New York, Wisconsin and Canada, the prospects are not much better. The harvest is disappointing due to the heavy rain recorded at the end of the summer. The demand, in any case, stays low. As a result, the market is stable. Traditionally, the demand starts falling by the end of January or early February. Should the demand rise, it will immediately be reflected in the price. A trader says that the price of white onions, which currently stands at 25 dollars, could easily rise by 10 dollars. The rising demand seems to come from abroad, from countries like Mexico and the Netherlands, which demand increasingly more onions. The price is currently still on the high side, although that could still quickly change. For the red onions, the price reaches 4 dollars in a bad market and 7 dollars in a good market. "We are currently getting 5.50 to 6 dollars, so that's good," says a trader. Meanwhile, Mexico has started shipping yellow onions, although the peak won't be reached until March. In the US, there are 2 million bales of onions less in storage. In March, as soon as Michigan, New York, Wisconsin and Canada have nothing left in storage, the demand from these states will rise. In recent years, these regions have had enough with their own production. One of the largest growing companies in South Australia reports that the harvest is slightly smaller than last year. The strong winds and the persistent drought have taken a negative toll on the harvest. According to reports, there have been no issues with diseases. Given the significant planting of short, medium and long day onions, the harvest will probably last until March. The domestic market was oversupplied last year; as a result, producers and traders based their growth strategy on the promotion of exports. The sector has launched various initiatives to further invest in this field. The onion market in China is currently very good. In early 2018, things didn't go as well and prices were somewhat low. This time, however. given the problems in Europe (caused by a much lower onion production than in other years), the demand for Chinese onions has improved considerably in the second part of the year. At the moment, a lot is being exported from China to Europe, but Southeast Asia is still an important destination for Chinese onions. The most popular variety in Europe is the yellow onion. The demand for red onions is lower, because it is exported to Europe from India. Onion prices are also currently higher than those recorded around this time last year. The price has risen not only because of the rising demand, but also because the shipping costs from the port of Qingdao to Rotterdam have become more expensive. During the Chinese New Year, everything comes to a halt for a while, but onion shipments have been resumed this week. Since neighboring Kazakhstan and Russia have increased their onion productions, Kyrgyz onion growers have been looking for alternatives. In recent years, Kyrgyz onions have had a good position in these markets, but they are now having to give up that place to domestic products. Exporters are therefore looking for new export destinations. Not surprisingly, they see opportunities in Europe.